FIGURE 1. 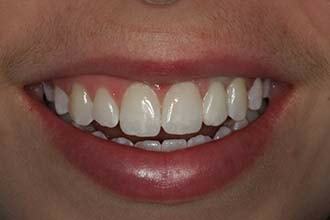 Pre-operative view just after orthodontic appliance removal. Restoring a single anterior tooth has always been the most difficult esthetic restorative procedure in dentistry. If this isn’t challenging enough, take away the tooth and have to recreate the natural gingival contour and papilla, one has a whole new list of challenges to overcome. One of the most rewarding gifts you can give someone is a natural looking implant. In this case, a 17-year-old female had finished orthodontics and was excited to come up with a conservative alternative to not wearing a removable temporary partial. She had selected the option of having an implant versus irreversibly altering her neighboring teeth to support a bridge. 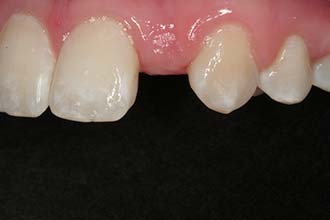 In this article you will learn how to predictably create a natural looking single anterior implant supported ceramic restoration. This seventeen year old female had #10 congenitally missing. 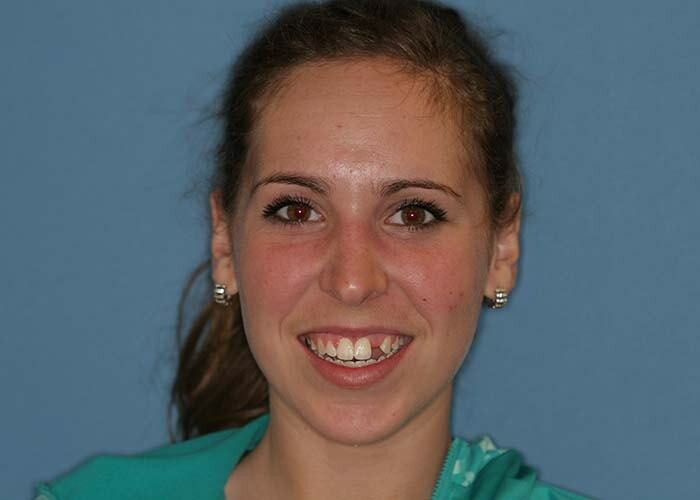 She had gone through two years of conventional orthodontic treatment to open up the space for #10. When she came to the office she had been recently debanded and had been wearing a Hawley retainer with a denture tooth in the #10 location. She was healthy with non-contributory medical history (Figs. 1-6). FIGURE 2. 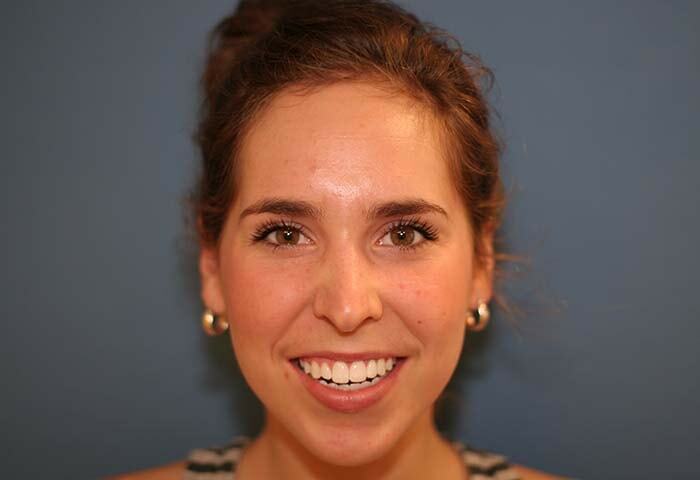 Her smile has an occlusal cant that we will fix. FIGURE 3. The space for #10 is symmetrical to #7. FIGURE 4. Currently there is a flat ridge without papilla. FIGURE 5. Her anterior teeth have a lot of characterization that will need to be created in the final restoration. A pre-clinical exam was performed. FIGURE 6. The labial deficiency can be visualized in the #10 edentulous space. The cone beam image confirmed the deficient labial plate would need a graft. FIGURE 7. The diagnostic wax-up was used to guide the oral surgeon for the implant placement and grafting. 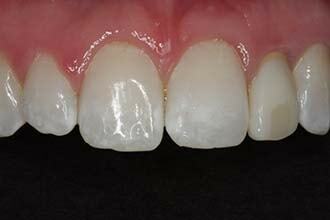 Then at the restorative phase it was used to fabricate the provisional restoration. The flat ridge will present a challenge to re-create a natural appearance. A digital PAN, cone beam image, AACD photo series, models mounted with a KAVO facebow transfer, centric relation bite registration (mounted on a KAVO Protar articulator), a horizontal bite stick, intraoral exam and a full mouth pocket charting.2 A diagnostic wax up was created for tooth #10, along with a surgical guide to assure the implant position and depth were placed as ideal as possible (Fig. 7). Clinical exam revealed flat mesial-distal tissue contour in the edentulous site (Fig. 4). The labial bone and soft tissue were deficient to create ideal esthetics (Fig. 6). 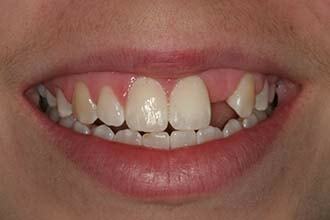 Her gingival tissue was still healing from the bands she had on her posterior teeth. The clinical tooth space for #10 was appropriate although the #11 root was tipped mesially but the cone beam image revealed there was adequate space to place an implant fixture. 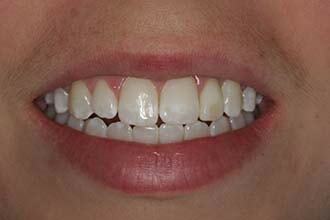 Examining her smile more carefully revealed an occlusal cant where her right side was lower than her left. Tooth #8 was lower than #9 and #7 was proportionately too small (Fig. 2). 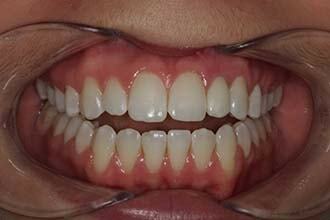 The patient demonstrated excellent oral hygiene with no periodontal pockets. Radiographs revealed good bone support and no tooth decay. There were no TMJ signs or symptoms. The cone beam confirmed there was deficient bone on the labial surface therefore the implant would not be stable enough to support an immediate provisional crown at the time of surgery. The findings were presented and the option of just replacing tooth #10 was presented along with more comprehensive options to level her occlusal cant and create better symmetry to her smile. She reconfirmed what she had mentioned in the pre-clinical exam that she was happy with her smile and was looking to just do whitening and replace tooth #10 without disrupting her natural teeth. Once confirming her treatment goals and expectations the final treatment plan was presented. 1. Tooth #10: She will have an Ankylos 3.5 mm implant fixture placed in the #10 site with a cover screw. A bone graft will be done at the same time to create better tissue support and to minimize darkness shining through from the implant fixture. Due to the lack of bone she would continue wearing her Hawley retainer until the fixture was fully integrated. 3. 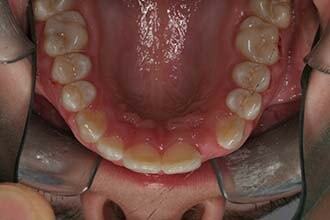 After allowing the tissue to heal for two months, Zoom whitening along with take home trays will be done. FIGURE 8. Her smile with the provisional on #10 was evaluated. FIGURE 9. 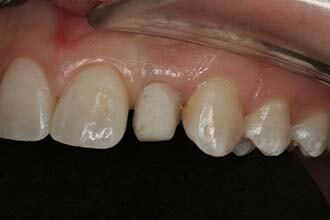 The #10 tissue height in relation to her anterior dentition was evaluated. FIGURE 10. The papilla development and zenith location was evaluated. The surgeon placed an Ankylos 3.5 mm by 14mm fixture and then placed a sulcus former cover screw. The Ankylos sulcus former cover screw works very well in forming a natural sulcus even though it is buried subgingivally. It has a conical shape that mimics the shape of an anterior root which makes the later provisional fabrication more predictable. After six months the implant was exposed. The tissue covering the top of the fixture was used for a mini sub epithelial tissue graft on the facial of #10. Then a plastic temporary abutment was prepped and designed to place the margins .5 mm subgingival. Using a matrix from the initial diagnostic wax-up (Fig 7. ), it was filled in the #10 location with A-1 Protemp, and then fully seated on her upper arch. After two minutes the matrix was removed and the provisional was removed by prepping through the incisal-facial to access the temporary screw. Then the provisional crown and abutment were lifted off in one piece. The excess was trimmed; the now one piece provisional was re-contoured to create ideal tissue contours. Adequate subgingival mesial-distal width was made to support papilla development and the facial aspect was under contoured to promote incisal migration of the tissue on the labial.5 Once the contours were appropriate the provisional was screwed into place and the access opening was closed with teflon tape, Filtek Supreme A2B and A1E. 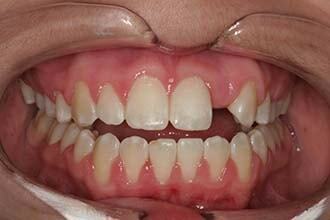 Patient returned one week later to assess the gingival development. The provisional was removed and additional contouring was done following the principles stated above. Then it was placed back for additional healing. Allowing two months for optimum tissue healing the provisional was re-evaluated. The gingival height, zenith position and papilla development were all assessed and at that time it was determined she was ready to go into the final restorative phase3 (Figs. 8-10). The provisional was removed again. Very quickly an impression post was placed and a full arch fixture level impression was taken. The tissue will collapse very quickly around the empty space so the impression of the tissue will not be entirely accurate. Therefore, while the impression was setting, the assistant screwed on an Anklos 3.5 mm analog on the provisional and flowed 3M light body imprint 3 around the provisional and analog and then placed it in a plastic dappen dish full of 3M heavy body tray material (Fig. 11). This gave the ceramist an accurate representation of the tissue contour you worked so hard to create with your provisional. After the impression an opposing model, face bow transfer, photos and shade selection were taken. Then the provisional was placed back on and the access was closed as described in provisional phase section of this article. FIGURE 11. The gingival contours of the provisional were being captured in an impression. The ceramist will use this to try-in the custom milled abutment along with the final restorations to verify ideal adaptation to the patient’s gingival tissue. FIGURE 12. 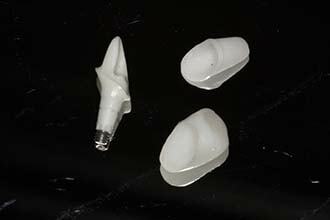 The completed restorations: The custom milled Atlantis zirconia abutment (Atlantis Abutments, Dentsply Implants Waltham, MA. 800-531-3481), the e-max coping and the e-max crown (Ivoclar Vivadent USA, Amherst, NY. 800-533-6825). FIGURE 13. 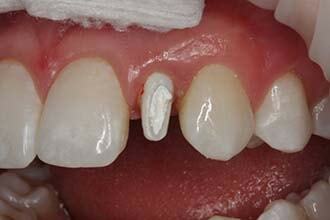 The Atlantis zirconia abutment was tried in. Note it completely fills the space occupied by the provisional. The margin is about .5 mm below the gingival crest. Teflon tape is in the access opening to block out the darkness generated from the screw inside. Three weeks later we have fabricated an Atlantis zirconia custom abutment, an e-max coping, which was HF etched on both the inside and outside. And the third component was an e-max ceramic crown HF etched on the inside only6 (Fig. 12). The provisional was removed again. The zirconia custom abutment was tried in to verify if it filled the developed implant site and was supporting the tissue properly.7 Then teflon tape was placed in the access opening (Fig. 13). The opaque white tape works well to hide the dark screw inside. The next step was trying in the e-max coping with 3M translucent paste to check the value (Fig. 14). The objective of using the coping is to replicate a dentin shade not unlike a naturally prepared tooth. 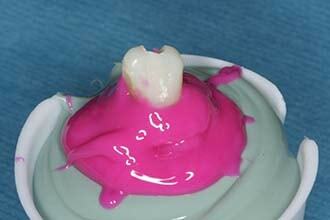 Lastly, the e-max crown with the same translucent try paste was tried in (Fig. 15), verifying not only the chroma, hue and value were correct but assessing the characterization, surface texture, contours, gingival tissue support, gingival height and zenith position. Proper proximal contacts and occlusion were verified and the restorations were determined to be ready for final placement. 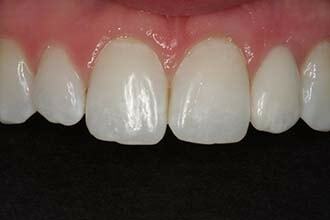 The gingival area was slightly over contoured and it was polished back accordingly. FIGURE 14. 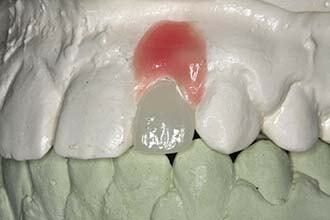 The e-max coping was placed over the zirconia abutment with try-in paste (Ingot LT BL-1 with custom tinting). The proper dentin shade was verified. Note the HF etched surface. FIGURE 15. 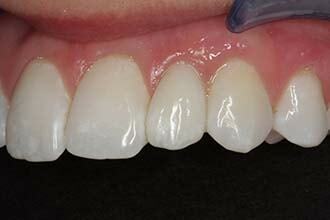 Try-in of the custom tinted and characterized e-max crown (Ingot LT BL -1). The overall contour, shade, proper amount of characterization and tissue adaptation was verified. Note the blanching of gingival tissue. FIGURE 16. Post-op views one week after placement. The surrounding mouth tissue had healed well. Tissue contours around restored tooth appear natural. The shade of area tissue blends beautifully. 1. Rinsed the try-in paste away with water spray, cleaned with Ivoclean for 20 seconds, applied 3M silane for 60 seconds on the inside and outside of the e-max coping and on the inside of the e-max crown. 2. The zirconia abutment was placed back onto the implant fixture and torque to 15Ncm. 3. Teflon tape was packed into the access opening (Fig. 13). 4. 3M Universal adhesive was applied to the zirconia abutment and to the inside of the e-max coping, air thinned, a thin layer of 3M translucent Universal cement was placed inside the coping and then placed on the zirconia abutment. The dual cure universal cement was carefully and quickly cleaned up. 5. Then the e-max crown was lined with a thin layer of 3M translucent light cure only resin veneer cement and placed over the coping. 7. Finally the occlusion was fine-tuned. Since the natural teeth were all dehydrated the patient was dismissed for one week to reevaluate tissue healing and shade evaluation. Patient returned in one week for the final evaluation. The tissue had healed well. Tissue contours looked natural and the shade blended nicely with her remaining dentition.8 Everyone was happy with the results (Figs. 16-20). It is important for the restorative dentist to align oneself with a highly skilled surgeon and ceramist. As a team they can take seemingly complex situations and make them consistently predictable. This starts with an honest discussion with the patient to determine their expectations, and whether or not a full mouth rehabilitation is needed. Then with thorough treatment planning and good patient communication the various implant restorative issues that can occur during treatment can be anticipated and not a surprise to the patient and practitioner.9 In the end, following the principles discussed in this article, single anterior implant restorations can be predictable and personally rewarding. Dr. Montgomery graduated from the University of Minnesota School of Dentistry in 1986. He has maintained a cosmetic oriented family practice in Woodbury, Minnesota since 1986, and is He is accredited by the member American Academy of Cosmetic Dentistry. 1. Hornbrook D. The Art of Esthetics (lecture) American Academy of Cosmetic Dentistry Annual Meeting Florida 5/03. 2. Hastings JH Laboratory communications: Essential keys to exceptional results. AM Acad Cosmetic Dent J1998: 13(4): 22-30. 3. Kois JC, Kan JY. Predictable peri-implant gingival esthetics: surgical and prosthetic rationales. Pract Proced Aesthet Dent. 2001 Nov-Dec;13 (9): 691-8; quiz 700, 721-2. 4. Watkin A, Kerstein RB. 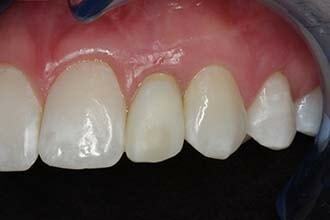 Improving darkened anterior peri-implant tissue color with zirconia custom abutments. Comp Contin Educ Dent. 2008 May; 29 (4): 238-40, 242. 5. Saadoun PA. Multifactorial parameters in peri-implant soft tissue management. In: Romano R, editor. The art of treatment planning: dental school and medical approaches to the face and smile. London: Quintessence Pub. ; 2009. p. 77-153. 8. Academy of Cosmetic Dentistry guide to Accreditation. 9. Touati B. 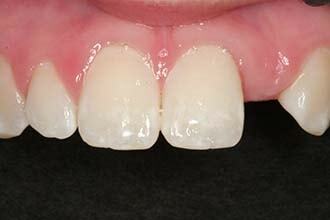 Treatment planning for esthetic anterior single-tooth implants. In: Romano R, editor. The art of treatment planning: dental school and medical approaches to the face and smile. London: Quintessence Pub. ; 2009. p. 67-73. This article was also published at the highly regarded Oral Health Group website on April 1, 2014.